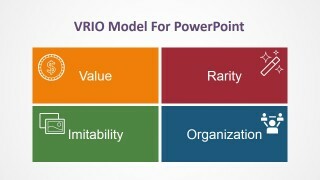 VRIO Model PowerPoint Template – During Strategic Planning organizations employ different business tools in order to analyze different points of view of their business and environment. 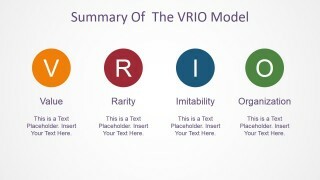 The user can edit the VRIO Model PowerPoint Template and complement any Strategy presentation with the VRIO properties analyzed during the strategic process. 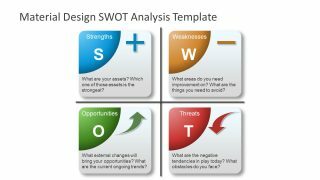 Value: Does this resource/capability enables the organization to exploit an opportunity or block an external threat? If it does, the resources/capability can be considered a strength of the organization. 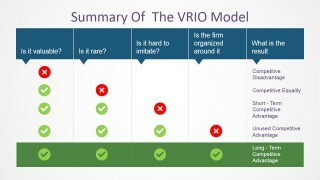 The VRIO Value analysis generally starts with the review of the Value Chain of the organization, looking for assets that have optimized certain pieces of the chain. 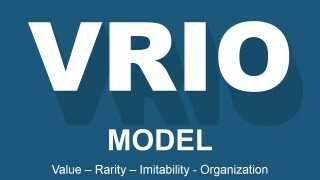 In most of the cases, this assets can be considered inside the Value concept of VRIO. 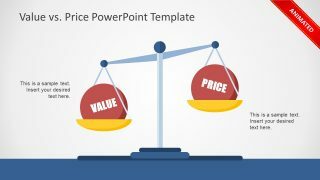 Another interpretation of the Value concepts is for those resources/capabilities that increase the perceived value of the customer. Rarity: Does control of this resource/capability in hands of a few (in the market)? 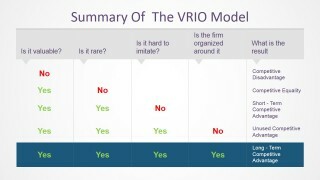 The rarity concept of the VRIO framework requires that the resource/capability labeled meet the short supply and persistence over time condition. If these are not met, the resource/capability cannot generate a sustainable competitive advantage. Imitability: Is the resources/capability difficult to imitate? Or Does this resources/capability generate a cost disadvantage to the competing organizations trying to obtain, develop, or duplicate it? Imitation can occur in two ways: by directly imitating the resource/capability or by providing the substituting with a comparable resource/capability. 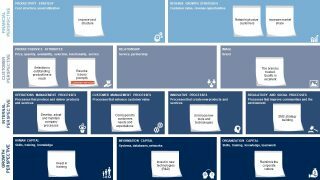 Organization: Is the organization structured, built and able to exploit the resources/capability? 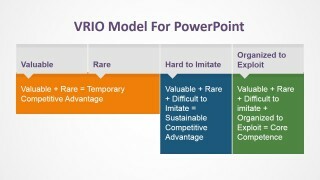 The resource/capability do not guarantee any competitive advantage for an organization by itself. 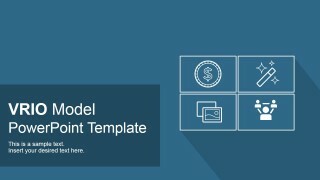 The form needs to be organized to capture the value from them. The organization is based around management systems, processes, policies ,structure and culture. 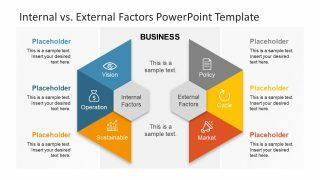 The user can apply the VRIO Analysis in conjunction with the SWOT Analysis Process; combine results of competitive advantage findings with our SWOT PowerPoint Templates and the VRIO Model PowerPoint Template. 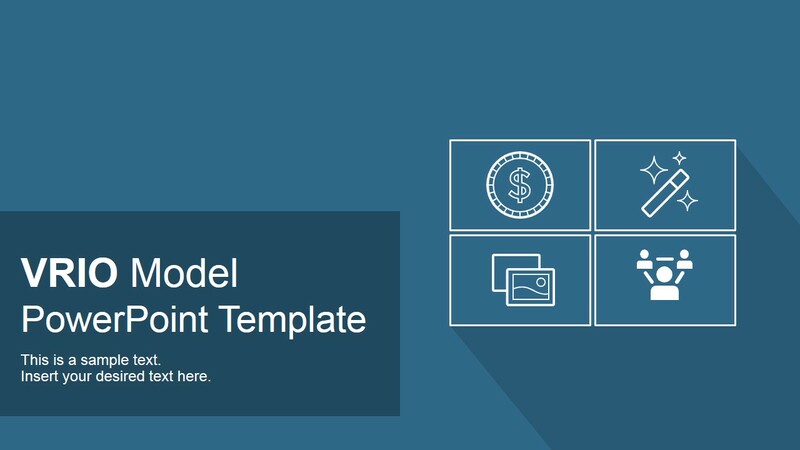 Create professional VRIO Model PowerPoint Presentations with the VRIO Model PowerPoint Template and impress your audience with graphics that appeal and engage.